Merle Hoffman, CEO of Choices in Queens NY was the keynote speaker at the Abortion Care Network conference, Standing Together: Our Passion is Our Power, May 20, 2012. She spoke to a crowd of abortion providers and their allies calling them "warrior healers who are practicing medicine in a war zone." Merle Hoffman appears on BBC Radio's "WOMAN'S HOUR" Abortion Campaigning Tactics (10.28): As the methods employed by anti-abortion activists become more visible, what does the change in campaign tactics mean for abortion rights in the UK? Kick off Women's History Month with Merle Hoffman, legendary abortion rights activist and the CEO/founder of the only woman-owned ambulatory abortion facility in the New York area. Merle is also the publisher/founder of the respected feminist journal On The Issues Magazine (www.ontheissuesmagazine.com). She recently published a memoir (Intimate Wars), in which she shares what life has been like for her on the front lines since 1971, the history she has lived through and her thoughts on what is needed today. Merle Hoffman on "The Fairness Doctrine" WDIS , Boston and Cape Cod, WWPR (Tampa Bay) KSKQ, Ashland, OR.Interview with Merle begins at 18:05 min. Merle Hoffman on WORT "The 8:00 Buzz" on Wed., Jan. 18: 9:30 am ET: 20 min. The 8 O'Clock Buzz is a one-hour, morning drive-time show that serves as a forum for community members to discuss issues of importance to the community. It features volunteer hosts with a wide array of experience and connection to the community. The show's format is a mix of music, culture, information, news and interviews. 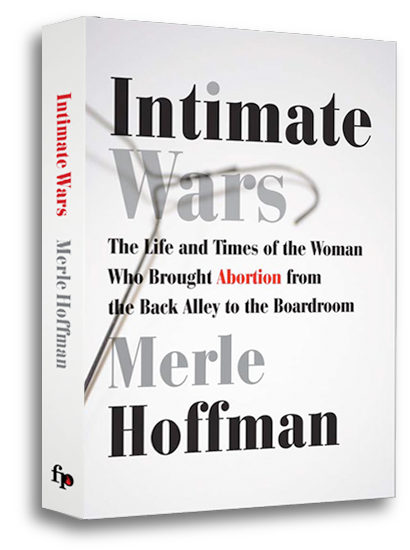 Merle Hoffman talks about Intimate Wars and the abortion issues on "Holy Hormones Honey with Leslie Botha," broadcast on KRFC, Fort Collins, Colorado public radio. Merle Hoffman recounts her life and career as a women's health care activist on C-SPAN2 BOOKTV.org on Monday, August 20th at 4am (ET). Merle Hoffman recounts her life and career as a women's health care activist . She recalls her founding in 1971, two years prior to the Roe v. Wade Supreme Court decision, of Choices, an abortion clinic in New York City. Merle Hoffman, who opened a clinic providing abortions before they became legal across America, talks about her career as a battle. "This is a full-frontal war on women and I've been in this war for over 40 years. I've seen it change its tactics – it was a guerrilla war, then my friend Tiller [abortion provider Dr George Tiller] was killed. The only thing that amazed me when it started this time round was how open it was, it used to be a subtle attack, but now it's very direct." Journalist Sheryl McCarthy talks with Merle Hoffman, founder, Pres. & CEO, Choices Women's Medical Center about her sources of inspiration. Intimate Wars is more than an autobiography. As the subtitle reads, it is "The Life and Times of the Woman Who Brought Abortion from the Back Alley to the Boardroom." It might also read, "and Who Has Continued The Fight For Four Decades." The woman is Merle Hoffman, who established Choices Women's Medical Center shortly after New York legalized abortion in 1971—two years before Roe v. Wade. Abortion, unlike many other issues taken up by Second Wave feminists, remains as hotly contested and as much of a political football as it was back in the day. Choices is expanding to Jamaica, NY! Merle discusses the landmark new Queesn clinic and the state of Abortion in America. She's Doing It: Merle Hoffman - "It Takes Bad Girls to Get Good Things Done"
Often when I speak about No Excuses, I ask "When did you know you had the power to __(fill in the blank)___?" This question intrigues people, but rarely does anyone have as clear and direct answer as Merle Hoffman, this week's "She's Doing It." She seems to have been born knowing, and born quite willing to buck the norm of being the archetypical nice and compliant "good girl" in favor of getting done the things she believes are important. The Susan G. Komen Foundation, the nation's largest and best funded breast cancer research charity, has found out the hard way that this nation's wannabe Christian theocrats will lay waste to anyone or any institution to make abortion unavailable in this country. The beleaguered charity should have consulted Merle Hoffman, author of the recently published memoir, Intimate Wars, before agreeing to the anti-abortion agenda of a vice president of public policy hired last year. The veep pushed Komen to stop funding Planned Parenthood breast cancer screenings under the guise of adopting new grant standards. Abortion pioneer: Defend rights or lose them: Merle Hoffman tells Salon that pro-choicers have their own inaction to blame if reproductive rights are curtailed. Truthout: Merle Hoffman was one of the trailblazers of the pro-choice movement in the USA, a controversial feminist who opened one of the first ambulatory abortion centres in America, and who has lived a life of boldness, ambition and, dare I say it, ego. Many times throughout the book I wrinkled my nose in distaste at her decisions, and her attitudes, and then had to ask myself how much more "natural" I would have found them if she were a man. In that respect the book was very challenging for me, in a good way. Excerpt from Intimate Wars: Twenty years ago I attended a party at which a numerolo­gist offered to analyze my name. After performing what appeared to be complicated mathematical computations she told me my number was eleven—a "power number"—then looked at me quizzically. The Millionaire Abortionist: 'Women's Lives Are My Business' online at Forbes.com in a one-on-one interview with Meghan Casserly. 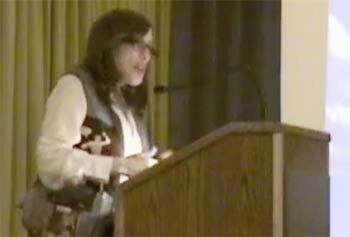 Merle Hoffman Describes Her Life in Activism in an interview with Feminists For Choice, a collective of women's rights advocates that was founded in the Spring of 2009. 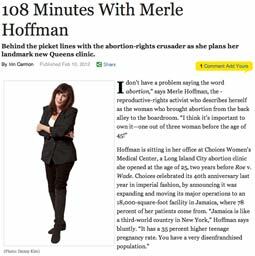 Visit abortiongang.org for the full Ten Question interview with Merle Hoffman about feminism, motherhood, and her memoir.